Heat the oven to 160C. Melt the butter in a small saucepan. Get out the pastry and keep it under a very slightly damp tea towel to stop it drying out. Brush your tray (see above for sizes that work) with melted butter. Cover the base with a sheet of filo and brush lightly with butter. Repeat layering and buttering until you have used nearly half the dough. Blitz nuts in a processor until around half are finely chopped and half are coarsely chopped. Spread over the dough in your baking tray. Cover the nuts with more layers of buttered filo, as before, until the packet has been used up. Butter the top layer too. 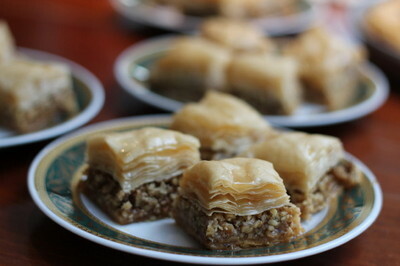 Then use a sharp knife to trim the pastry edges and cut the baklava into squares, diamonds or triangles. Bake for one hour in the lower third of the oven, or until the top is golden and the pastry cooked all the way through. If the top is going too dark before the baklava is done, cover it with some baking paper. Meanwhile prepare the syrup: Put the sugar in a saucepan and pour around the water. Cover and heat gently until all the sugar has dissolved, without boiling. Now uncover, add lemon juice, orange/rose water or vanilla, bring to a boil and then simmer for 15 minutes or until it has thickened slightly. When the baklava is done, remove it from the oven and pour the hot syrup all over. Let sit for a few minutes then re-cut the shapes to check they will lift out easily. Let cool. Serve with tea or coffee. The only time most people got to eat baklava was when an acquaintance returned from a Turkish holiday with a box of the stuff. hi there am a little confused about the essence part is it 2 tbs lemon juice and 2 tbs each or orange flower and rose water or is it either or? Sorry – I see it’s not clear. I meant that you should choose either lemon juice or orange blossom water or rose water or vanilla. In actual fact a combination of two of these would be nice. But I wouldn’t combine rose water and orange blossom – they will clash. Personally I like orange blossom with walnuts and hazelnuts, and rose water with pistachios.